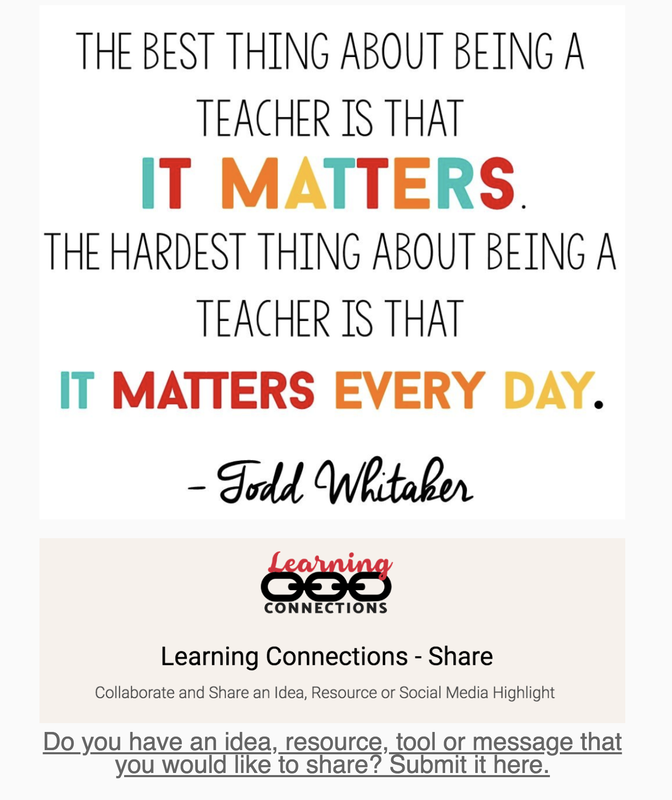 Working on a large campus with upwards of 200 teachers I get excited every time a teacher discovers Twitter, connects with a Facebook group or more recently connects through Instagram. As much as I would like to say the majority are collaborating in these spaces and building PLN's outside our building we aren't there YET. Last May I had an idea to try and reach the teachers that were not connecting in the spaces above through good old email. I looked at the different platforms that I could use to create an email that was not just created in Outlook but in a space where it could be a resource. Smore was my first choice, however with the email filters in place in my district the communication didn't come through consistently or if it did all the resources did not show up correctly. I use Constant Contact for our school eNews, but it wasn't going to work for what I wanted to push out to faculty. So for the teachers, I chose to use Mail Chimp. I am grateful that there are so many tools to choose from! I follow the same formula in each email. 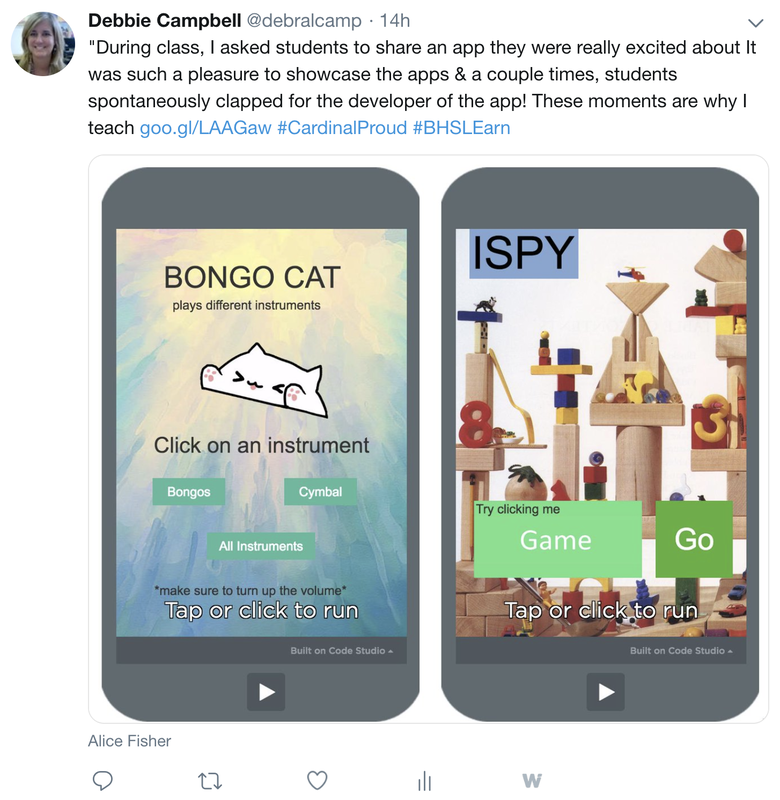 I share a strategy, a resource (usually a blog post or podcast), a tech tool, and finally some of the social media posts from our faculty. I love to share these highlights! 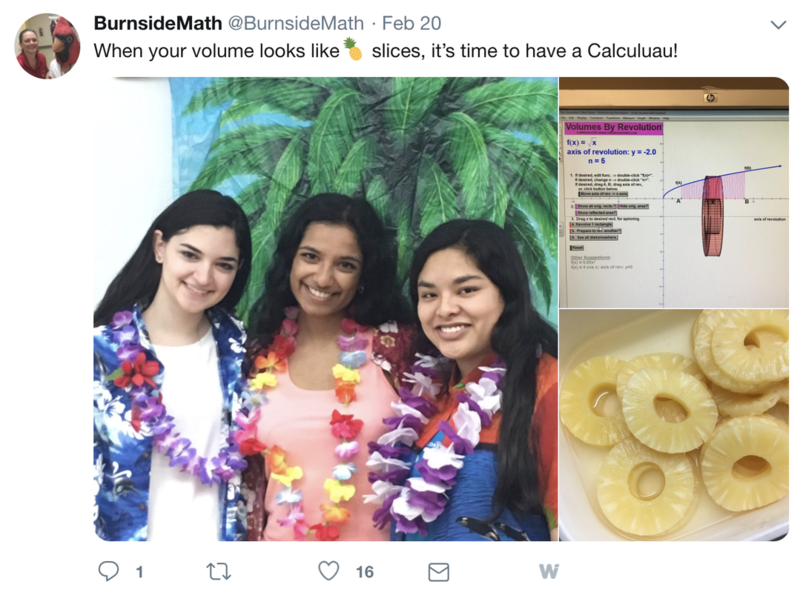 For teachers not using social media, the embedded posts give them an idea of what other teachers are doing. It also reinforces that social media posts are interesting. I make all of the posts clickable in hopes that people might discover more than the single post they clicked on. Each year our story grows on social media painting a stronger picture of who we are as a school! While i am pushing this content out to them, I am hopeful eventually it will start to pull them into spaces where they can pursue their own interests and connections. If you want to subscribe to the mailing list and receive a copy of the emails that are sent out in the future click here! Please feel free to use the format and any content that has been curated! Below is what the latest Learning Connections email out looked like. Connecting ideas, people, tools and opportunities to learn. 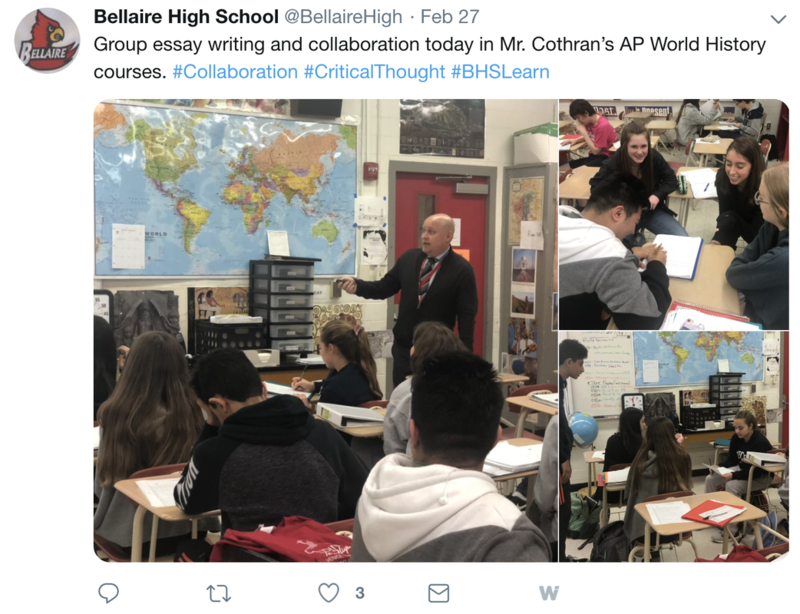 ​Learning Connections is a communication that has been created to help connect educators at Bellaire HS to ideas, people, tools, and strategies. Our goal is to create a space that you can browse when you have time. We will be sharing interesting educational posts, podcasts, and online courses with you periodically. We will also be spotlighting different uses of Social Media on campus. 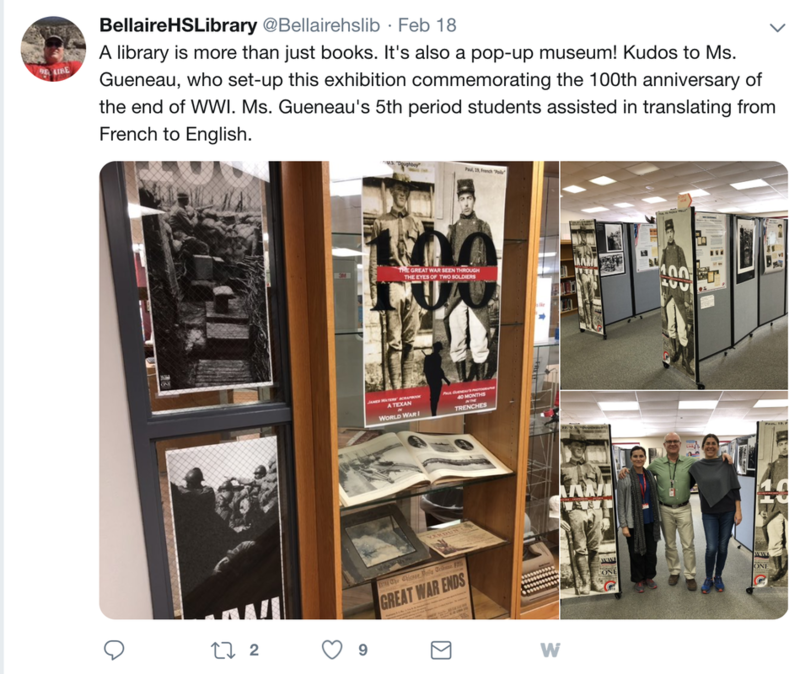 Each of these moments helps to tell Bellaire's story.This communication is intended to be collaborative moving forward and a product that is crowd-sourced by the Bellaire faculty. You'll be able to send in ideas through a form at the bottom of this message or tag items #BHSLearn on Twitter. You’ll probably agree with me when I say, “200% more growth than peers” is quite a stretch. In our recent nine-week action research, students who focused on visible learning strategies outperformed their peers on district standardized tests. But that’s not all. They achieved over 200% more growth than their peers. We’ll get into our results more, but first how? What are visible learning strategies? The Google Tribe Podcast offers you tips, tricks, and hacks for making the most of the arsenal of teaching tools Google Classroom has to offer. Whether you want help with Google Docs, Forms, Slides, or some other tool inside this huge suite of programs, this podcast has got the help you need. 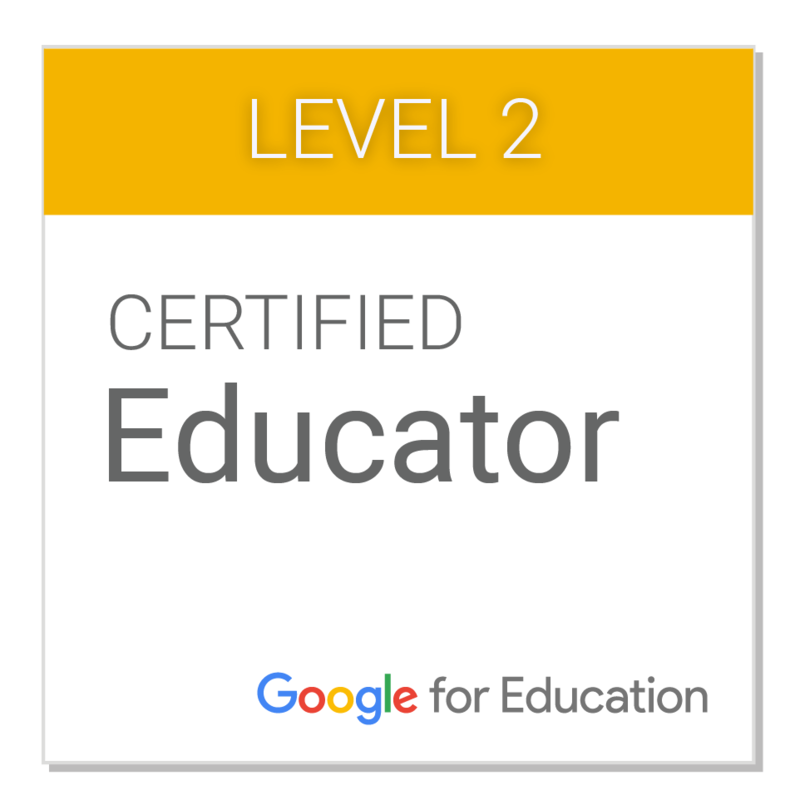 It will walk you through how to use Google Classroom to make learning better for your students—and life easier for you. Below are links to other editions of Learning Connections . 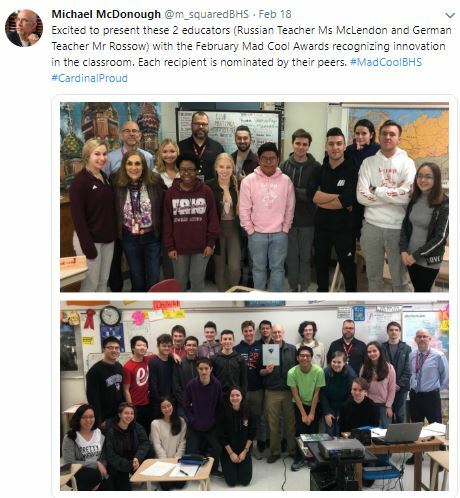 I would love to hear other ideas and see examples of how you connect with your teachers. Please share below or tag me on Twitter. I can remember the first twitter chat I tried to be a part of, I was on Twitter where I thought I should be participating, it was for goodness sakes a "Twitter Chat". I understood the question/answer structure in general and between trying to find the question in my stream and shorten my thought process to 140 characters (now its 280) I was always three steps behind. I wasn't able to respond or really interact with anyone else. I had moved from being a lurker to a participant, so there was progress. It was a frustrating experience though! Then I discovered TweetDeck and everything began to make sense. I could organize my content, responses and see the questions all in individual feeds. TweetDeck is a web interface that allows you to view tweets in real time. TweetDeck has many features you won’t find within the standard Twitter interface, but we will focus on what it specifically does for Twitter chats. 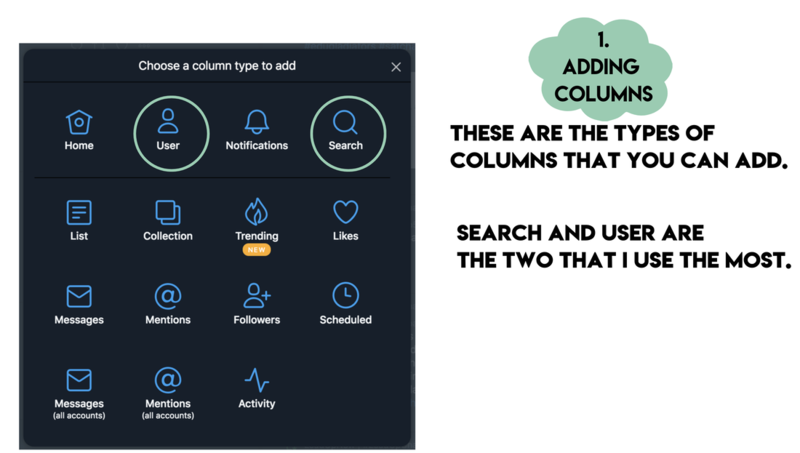 In short, you can create a specialized column that will auto update with tweets containing a specific hashtag or user. When you open TweetDeck, you will see your version of the following screen. 3 or 4 columns with a menu bar on the left. This page is completely customizable. Click on the sliders at the top right corner of any column and a options appear. You can sort a column, clear its contents, change the size of previews, filter by keyword, even remove the column completely. You will be able to customize the columns. Below is what Tweetdeck looks like when you are in the app. The screencast that follows the images shows you how to set your screen up and then how to use Tweetdeck in a chat. 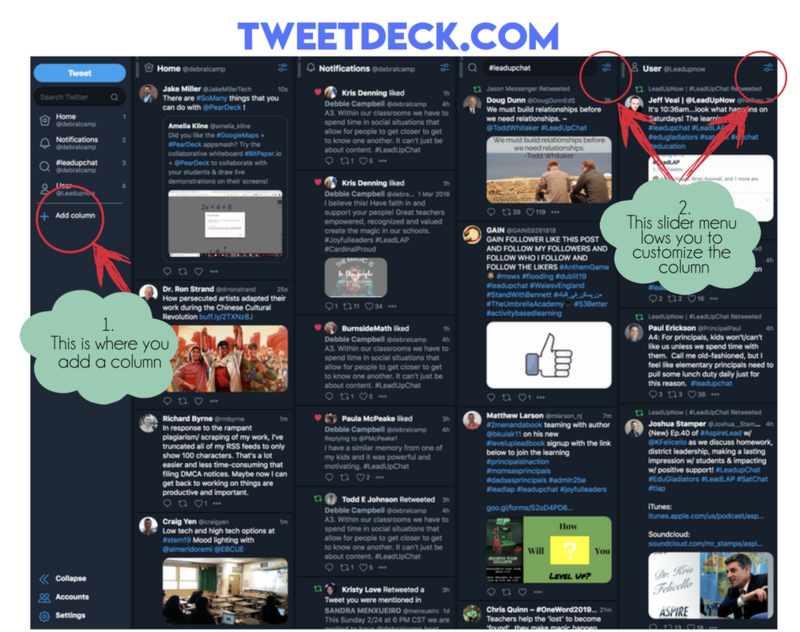 Watch below for step by step instructions on getting Tweetdeck set up and how to participate in a chat once your columns are set up. Once you are logged in and set up, you are ready to participate in a twitter chat the easy way. If you have questions send me a DM and I'll be happy to help you. Good luck learning and sharing your thoughts in your next Twitter Chat! I have searched and contemplated what my #OneWord or #ThreeWords would be for 2019. I had a long list that I considered and so I am going with three this year. I am going to follow my friend @JenniferHogan’s advice and hold myself accountable and reflect each month on my words and how I have worked to improve in these areas. Funny, I usually pick verbs but this year all three words are nouns. I chose “Arena” because iI represents the spaces that I want to show up in this year both personally and professionally. I want to be in spaces that I am not necessarily comfortable being in. Experiencing growth in any arena means surrounding myself with great people. I will be focusing on who is sitting in my support section. Brené Brown describes the “support section” as the people who have empathy for us and show us compassion. These same people give us the courage to try new things and are present when things are not comfortable. There is a lot of hard stuff to figure out and navigate through. New learning will remain a focus in the arenas that I spend my time in. I chose moments after reading “The Power of Moments” by Dan and Chip Heath and how 4 elements have the power to transform a moment. Elevation, insight, pride and connection are elements that we can work through to make moments peak. There will be times this will be easy and there will be times that focusing on these elements will create a different experience than what might have been ordinary. This word is one that my Dad would have loved that I am focusing on. It’s positive and uplifting to others as well. I will work towards creating, finding and sharing moments in 2019. I chose faith because it is my commitment to be quiet, still and listen. I suppose it is the key to helping me put my other two words into action. I am guilty of getting busy and not stopping to spend time with God. I am my best when my faith is front and center. ​It’s my hope that focusing on each of these areas and pausing each month to see how I am doing will lead to me being better. Wishing everyone the best in 2019! Here we go…. Failure is an opportunity for growth. It is evidence that I had the courage to try. It is the best way to learn how to do (or not do) whatever I am striving to achieve. Try not to ever pass up an opportunity to travel. Being a traveler expands world views, perspectives, and empathy in powerful ways.. It makes us more insightful and accepting. Use my opportunities and privileges to extend more opportunities and privileges to others. Things gather dust and most things will eventually end up in a donation box. Keep it simple. My time is the most valuable and precious commodity I have. Gifting it to others is the most meaningful gift I can give. Filling my time with people who make me feel motivated, challenged, inspired, valued, or loved is the most valuable and memorable gift I can give myself. I learned the Latin phrase alis volat propriis or "She flies with her own wings." It makes me smile. Finals are coming! 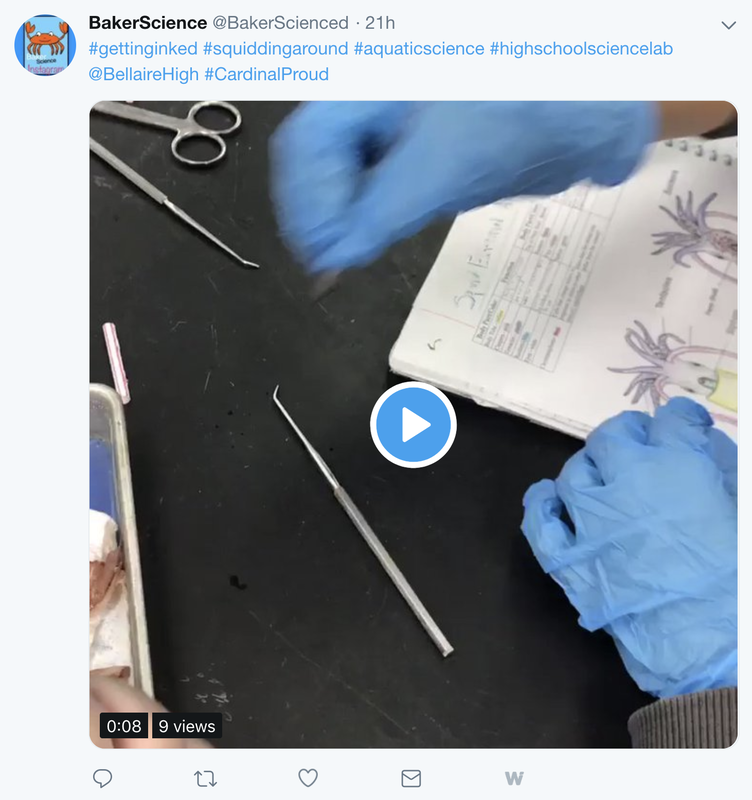 We assume students have the skills and tools they need to make connections and deepen their learning independently, but many times freshmen have never been exposed to skills and strategies to use. Creating a study plan is a first step students can take to help them experience greater success. 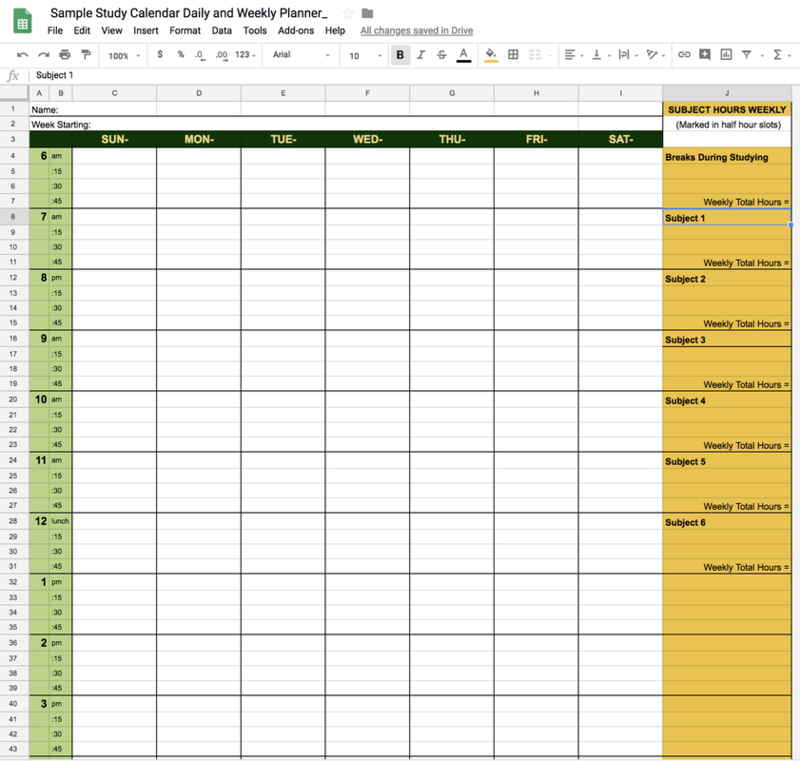 Creating a study schedule is a time management method that can reduce a student's level of stress by teaching them how to set aside the necessary amount of time for studying, and also how to use that time wisely. When reading about ways to help our students begin to get organized I came across a blog written by a student at the time in Portugal. She shares from a student's perspective 10 Essential Steps to Creating a Study Schedule. Students love to hear and learn from other students! A study plan can be created on paper or electronically. Need a template or a place to start? Below are templates you can make a copy of. Feel free to use as is or edit. Schedule your peak learning times for your hardest studying. There is no perfect plan: try to spread your studying over a period of 5 days or more, and reach your targeted number of study blocks. Be sure and schedule breaks and things to look forward to doing. Download a template to use on paper. Remember to use a pencil, you'll be making adjustments as you go. Make a copy of an digital template that you can update along the way. Encourage students to create a study plan that is reasonable Keeping in mind the amount of time they need to study and review each day, students also need to realize that, blocking off four hours, for example, with no break will set them up for failure. Develop a plan to communicate and share information with parents also. As we began to post our Finals schedule we also began to push out information to our parents through our weekly eNews. We also have a Study Skills and Resources section available on the Cardinal's Nest our Freshman website. Place the calendar or printed schedule in a visible location so that it is easy to see or if the schedule is electronic have it bookmarked and easily accessible. It is important to review, study, and self-test. First, spend a few minutes reviewing the material you studied during the previous study block; then spend most of your time reviewing the current chunk of material; then spend some time testing yourself on that material. Take the breaks that they have scheduled into their study time. Find a place or environment that is right and comfortable to study and concentrate. Include exercise and healthy snacks in your break schedule. Creating a plan is the first step. If you have additional suggestions or resources for students to use, please share them below so that we can all learn and help students draft a study plan that will help them be successful. Next post I'll focus on Retrieval Practice and how it plays such an important part in making learning stick. This fall we had the privilege of learning from Brené Brown and her team. An experience that I am truly grateful for! 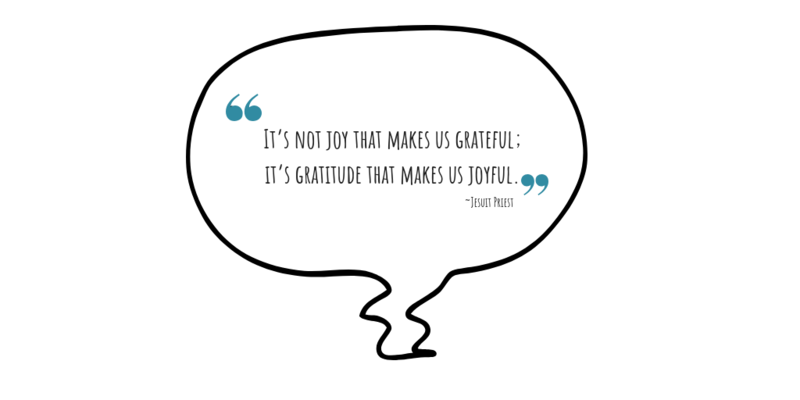 One of my many takeaways from our time together was that Dr. Brown shared that her research has shown that practicing gratitude invites joy into our lives. I wanted to learn to actively practice gratitude and so I set out to do just that. The #CompelledTribe's blogging topic for November is gratitude, so I have the perfect reason to reflect on my journey. At first, I tried to intentionally jot down things that I was grateful for as an entry in my bullet journal each day. This was helpful in that it slowed my thinking down and gave me a time to focus on what I was grateful for. My gratitude reflections were mixed in with other thoughts and notes from my day. I tried to read through my entries once a week, but it wasn't a great system. And then I discovered an App, Grateful, A Gratitude Journal, and added it to my iphone. The App notifies me at the same time every day to stop and write. This practice helps me to acknowledge the small and large things in my life that I am grateful for. The journal has a place for me to write a little or a lot. I can also attach photos to my posts, which I love. My photos range from people & places, to screenshots of texts or social media posts. The mixed media helps me to capture more moments than just being able to enter text. Looking back at the many moments I have recorded, some of the simplest entries are the most profound to me. The journal helps me focus on what really matters. I believe when Mark Twain said, “I can live two months on a good compliment,” he expressed the powerful impact kind words can have. He felt noticed and valued. I believe that when we show gratitude to a person by extending a genuine compliment a bond is strengthened, trust is built, and conversation encouraged. My journey this year has shown me that practicing gratitude is a cycle, you internalize and recognize a moment or situation and then you share it back to the source. Looking for the good in others or situations and showing appreciation costs us nothing. I am going to continue down this road and I hope to get stronger in my practice. I would love to hear your story and any tips you may have to pass along. We know that the best teachers are masters of their content and material, but they also know a lot about the process of learning. They have at their disposal a repertoire of instructional methods, strategies, and approaches. Master teachers remain committed to developing their content knowledge, while they continue to cultivate their repertoire of instructional strategies. Spend time in conversation with your PLC focusing specifically on instructional strategies and not content. 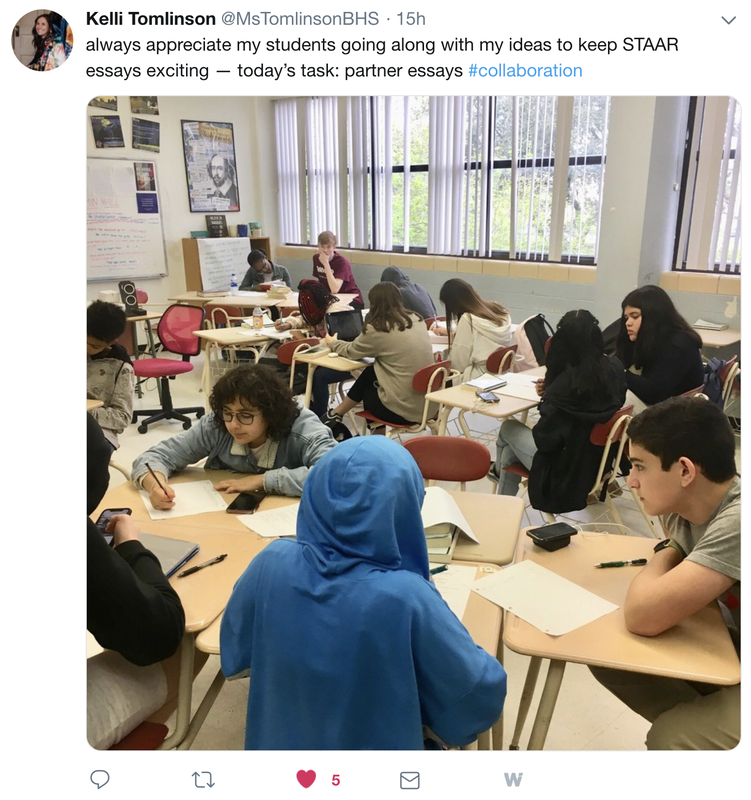 Explore Lead4ward as a resource and collaborate on strategies that might engage students in a variety of ways in your classroom. Check out the top 7 strategies that our teachers chose as ones they’d like to try or revisit in their classroom to check for understanding. There were far more than 7 but these got the most “mentions”. These strategies were curated by Learn4/forward and available in their app and on their website. » content just taught is like real life idea because __________. In addition to these strategies, teachers considered the idea of having a “no opt out” classroom. Intentionally using instructional strategies that bring all students into the learning and check their understanding help create classroom environments where all students are engaged. 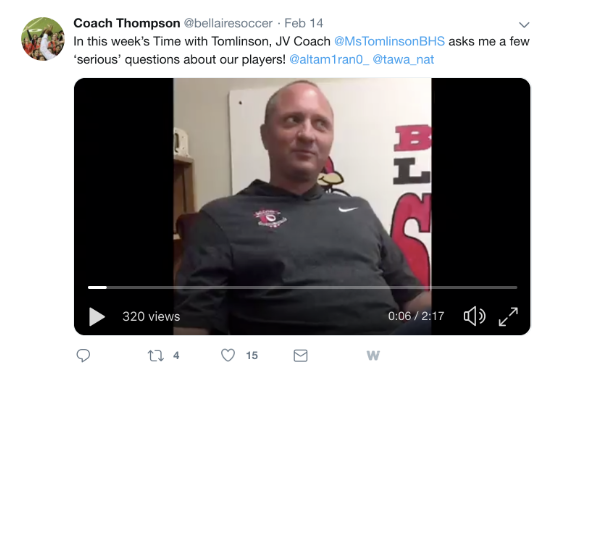 .A big shout out to @m_squaredBHS and @bellairesoccer for working with me on this! 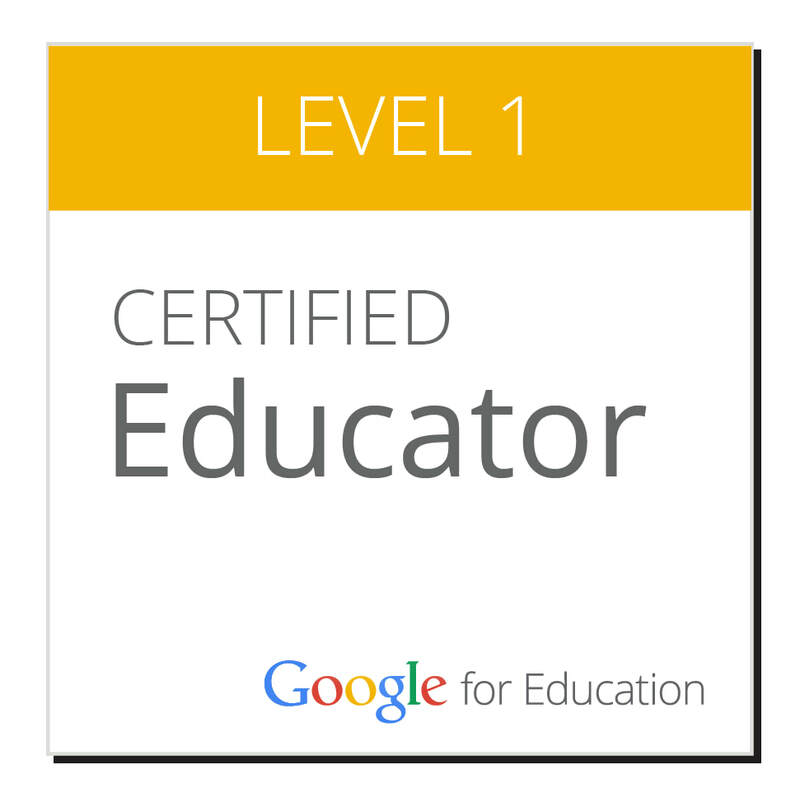 I used a Google Site to organize the content for teachers and we shared the link out to each faculty member. Our PLC leaders lead their teams. What I appreciated the most about the learning experience was listening to the conversations that each PLC engaged in in different rooms across the campus. I am grateful for the commitment to learning that our community engages in. We asked teachers to reflect and to give us feedback. 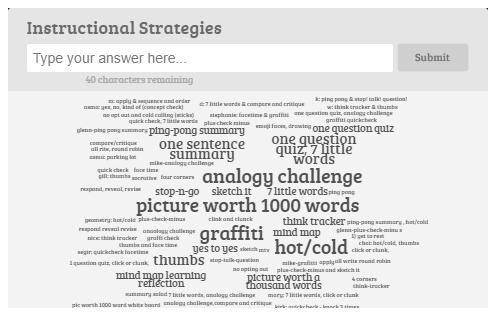 Below I’ll share a few of the responses that teachers submitted focused on instructional strategies. Full disclosure, the feedback was across the spectrum. There were people that didn’t value the experience and would have preferred to have been working on their final exam. If you’d like to see our feedback & wrap-up form, click here. Asking for feedback is part of what we consider part of our learning cycle with our faculty and staff and I highly encourage everyone to incorporate it into all professional learning opportunities. If you have additional instructional strategy resources please share them! One of the many things that I love about Google is that they are constantly seeking feedback and looking at ways they can get better. Here is a simple improvement that made them better. Whenever you want to create a new Google doc, slidedeck, form, sheet or site. Simply go to your browser's address bar and type in the type of Google app you would like to create followed by dot and "new". So for a Google doc you would type "doc.new" and press enter. A new Google doc will appear and you will be ready to get to work. Better is better....and this is better! Let's Plan - What Drives our Decisions? How many of us remember a time when we would meet with our team and decided what chapter we would be covering, who would be making copies of daily work and who would be making copies of homework? ​Current trends in education have seen an increase in the types of assessments used and how those assessments influence instruction in our classrooms. There is an increasing focus on making instructional data-driven decisions and using the information as a team to plan instruction. 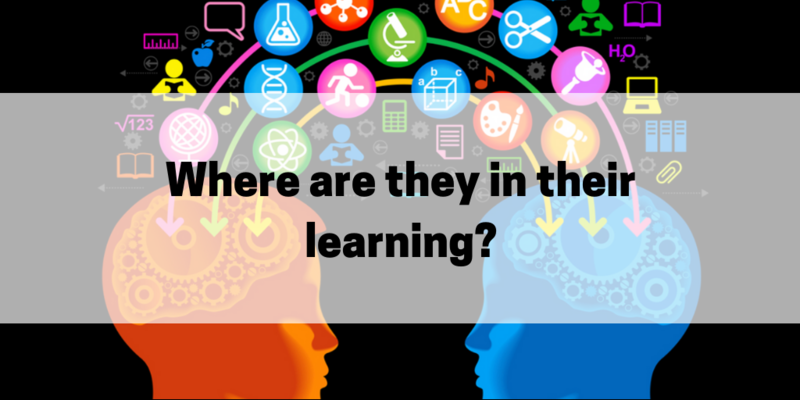 The names of assessments schools and districts use often lead to confusion. The following is a list of assessment terms that are being used in many schools and my simple definition and use of them. 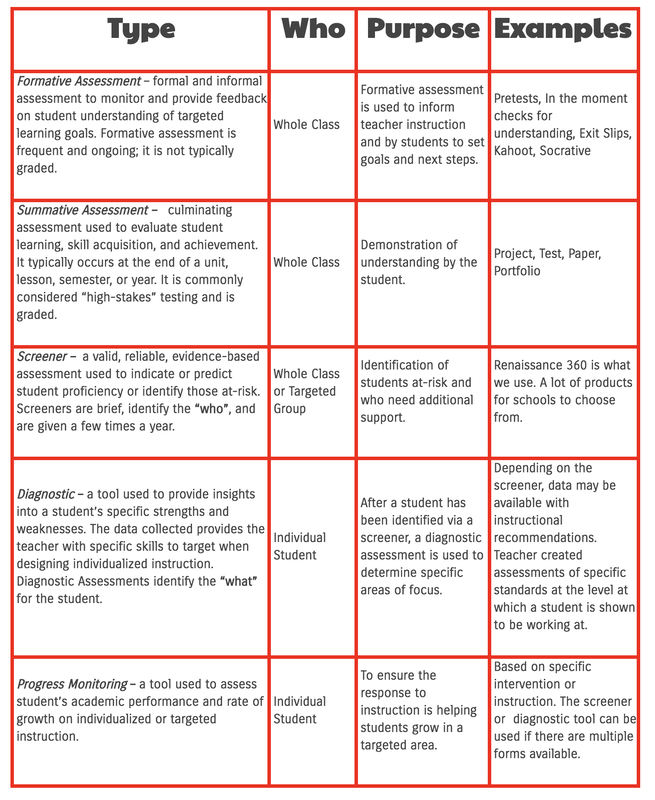 The assessments listed above are tools that educators have to use and administer at the classroom level. The first type of assessment, formative is a term commonly referred to in education. 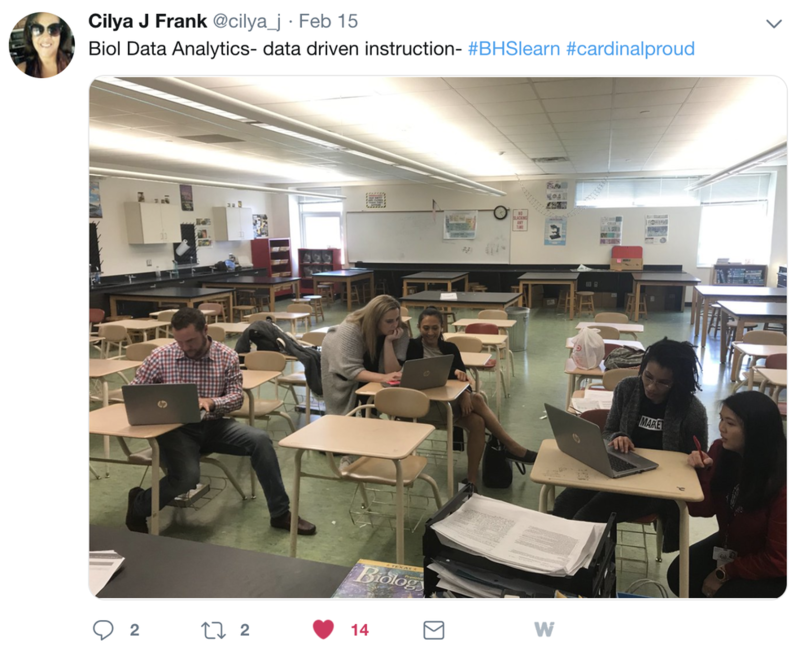 The use of formative data to alter instruction and to scaffold next steps forward in instruction varies from classroom to classroom. There are times that the formative data is being used to create a grade as an indicator to the student of their level of understanding. When the formative data is simply a grade to the teacher and instruction continues as planned the power of using a formative assessment is lost. (In other words.....I have taught it and you have either learned it or not and I am moving on.) In defense of many teachers, the pressure to move forward to keep up with a pacing calendar encourages this practice at many schools. The next three types of assessments: the screener, diagnostic and progress monitoring assessments are tools that are not as commonly referred to or used in many classrooms. In my experience, they are tools that can help identify where a student is performing at in overall literacy and numeracy. These types of assessments help educators know where to adjust the basic point at which instruction is going to begin. I think of it in terms of someone setting out to climb a mountain. Using the data from a screener and a diagnostic report allows a teacher to decide a starting point, for example reading level for the students they currently are teaching. 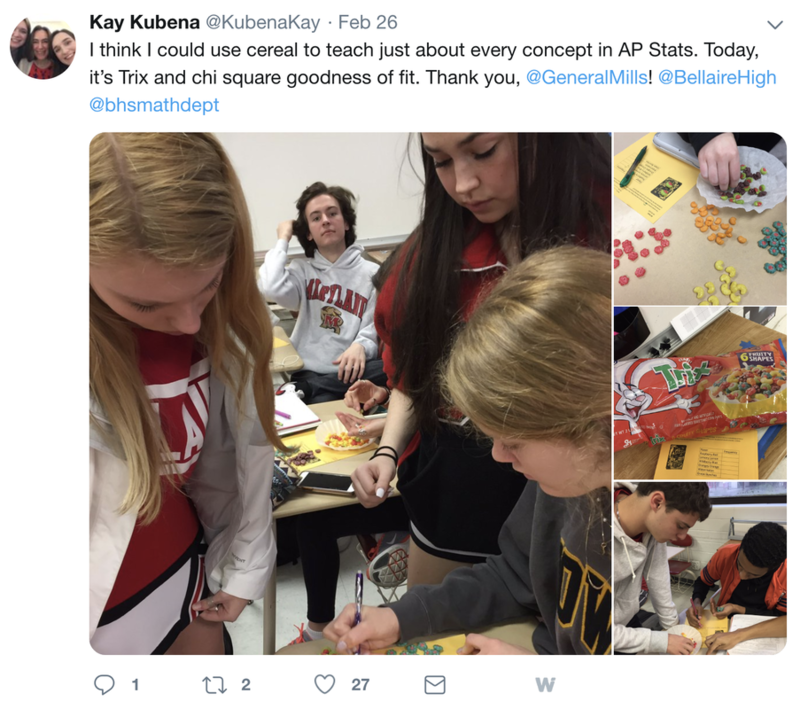 The use of progress monitoring allows educators to see in a snapshot if the strategies and instruction they are using are helping students show growth. When looking at the list above, summative assessments are used often in our classrooms to assess over-all learning. Creating summative assessments prior to instruction is critical. Summative assessments should be created by a PLC. When the PLC creates a common assessment it allows for every teacher to know what learners will need to know and at what rigor level they'll need to be able to perform at. My question, and it is a question because I don't know what the answer is, how do our summative assessments address the various starting points of our learners? Bringing all of these assessments together into one big picture takes a team, planning, brainstorming, and constant change. What it looks like and how instruction is affected cannot be scripted by pacing guides, and it is going to look different depending on the group of students. 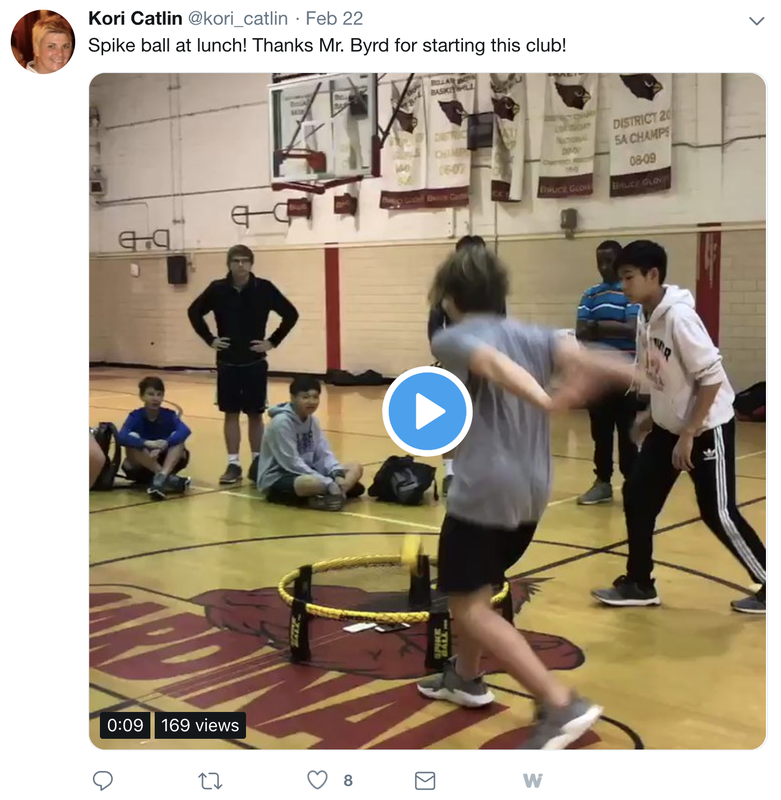 The challenge here is that the learning goals identified for students may be different than the standards identified by the student's grade level and course. This is where traditional classrooms and data hit a roadblock. Teachers need to be encouraged and supported throughout the process as it is complicated and hard work. Asking questions along the way as to the use of data, instructional adjustments and student progress should be at the center of our conversations. I believe we have learning to do around the implementation of interventions and varied instructional groupings, especially at the secondary level. Identifying technology tools that help differentiate and scaffold instruction is key to meeting more students needs. Realizing the need to learn is the first step forward to improvement.